The Brearley Collection is proud to share with you some of the comments and recommendations we have received from our customers. "For the past eight years, I have managed the Ballpark Planning & Development Department for the Boston Red Sox. As part of my role with the club, I oversee all of the artwork in the ballpark and our office space. Over the years we have frequently looked to the comprehensive Brearley Collection for historic photographs of Fenway park and former players for both display and research purposes. The Brearley family is always ready to assist us with everything from locating a specific, rare image to compiling several images of Red Sox greats, such as Ted Williams and Carl Yastrzemski. They are committed to providing the best quality images, with a focus on customer service and attrention to detail. I would strongly recommend Matt Brearley and the Brearley Collection to anyone seeking unique sports photographs." "The Brearley Collection is an exceptional resource of historic photographic images, printed with the utmost care. We’ve placed a number of Brearley prints in displays throughout Fenway Park and the Brearley Collection continues to be a key photography resource for our displays." 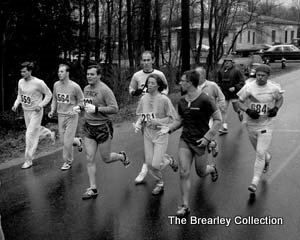 "What a thrill it was to find very important -- and I thought long-lost--historical photos of my pioneering run in the 1967 Boston Marathon at the Brearley Collection. The photos were essential to my book, Marathon Woman, and the Brearley folks were at all times pleasant, efficient and fair to deal with." "Our offices have many Brearley Collection baseball photographs displayed, dozens of which have been signed and inscribed by the players. The quality of these classic photos gives our conference rooms the aura of a museum." "I have had the pleasure of working with Dennis, Susan & Matt Brearley for the past 20 years. It's a relationship that has enriched my collection of wonderful photos from original negatives, especially the ones of Ted Williams, Carl Yastrzemski and other Red Sox Greats. The photos are in a class by themselves." "I can't express how impressed I was with Matt Brearley and the service I received using Brearley.Com. I ordered photo prints to be matted and framed for my son's birthday. I needed a rush job and emailed Matt Brearley. Matt went above and beyond in meeting my delivery needs and in fact personally drove them to me before the requested date. The quality was superb and they were the hit of the party. Many people inquired where I had them done and I gladly passed on Brearley.Com. I have never endorsed a website nor product before but at Brearley.Com you can shop confidently and know you will get quality products with personalized service, not often found in businesses these days."